Bombing raids by Allied forces during the Second World War not only caused devastation on the ground but also sent shockwaves through Earth's atmosphere which were detected at the edge of space, according to new research. 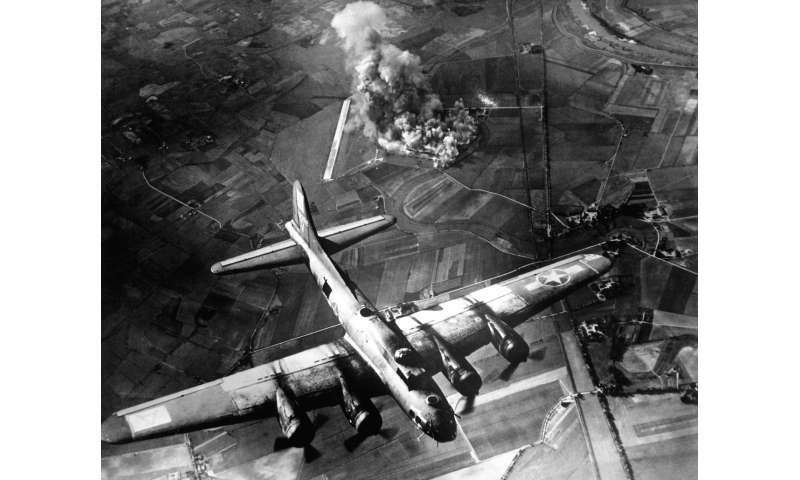 University of Reading researchers have revealed the shockwaves produced by huge bombs dropped by Allied planes on European cities were big enough to weaken the electrified upper atmosphere—the ionosphere—above the UK, 1000km away. The results are published today in the European Geosciences Union journal Annales Geophysicae. Scientists are using the findings to further understanding of how natural forces from below, like lightning, volcanic eruptions and earthquakes, affect Earth's upper atmosphere. Chris Scott, Professor of Space and Atmospheric Physics, said: "The images of neighbourhoods across Europe reduced to rubble due to wartime air raids are a lasting reminder of the destruction that can be caused by man-made explosions. But the impact of these bombs way up in the Earth's atmosphere has never been realised until now." "It is astonishing to see how the ripples caused by man-made explosions can affect the edge of space. Each raid released the energy of at least 300 lightning strikes. The sheer power involved has allowed us to quantify how events on the Earth's surface can also affect the ionosphere." In the study published today in Annales Geophysicae researchers looked at daily records at the Radio Research Centre in Slough, UK, collected between 1943-45. Sequences of radio pulses over a range of shortwave frequencies were sent 100-300km above the Earth's surface to reveal the height and electron concentration of ionisation within the upper atmosphere. Researchers studied the ionosphere response records around the time of 152 large Allied air raids in Europe and found the electron concentration significantly decreased due to the shockwaves caused by the bombs detonating near the Earth's surface. This is thought to have heated the upper atmosphere, enhancing the loss of ionisation. Although the London 'Blitz' bombing was much closer to Slough, the continuous nature of these attacks and the fact there is far less surviving information about them made it more challenging to separate the impact of these explosions from natural seasonal variation. Detailed records of the Allied raids reveal their four-engine planes routinely carried much larger bombs than the German Luftwaffe's two-engine planes could. These included the 'Grand Slam', which weighed up to 10 tonnes. Professor Patrick Major, University of Reading historian and a co-author of the study, said: "Aircrew involved in the raids reported having their aircraft damaged by the bomb shockwaves, despite being above the recommended height. Residents under the bombs would routinely recall being thrown through the air by the pressure waves of air mines exploding, and window casements and doors would be blown off their hinges. There were even rumours that wrapping wet towels around the face might save those in shelters from having their lungs collapsed by blast waves, which would leave victims otherwise externally untouched." "The unprecedented power of these attacks has proved useful for scientists to gauge the impact such events can have hundreds of kilometres above the Earth, in addition to the devastation they caused on the ground." Why are they measuring the effects on F1 and F2, but not the lower D or E layers? Shouldn't the effects be greatest there? Viet Nam resulted in more than twice the tonnage of bombs dropped in Europe. Seven million tons. That boggles the mind. And on such a small area compared to Europe, too. Wow. well walt, you gotta understand, if we didn't win that war? It never happened! An amazing number of Americans ignore their failures. Whether personal or financial or national. Like a cat shitting on the kitchen linoleum. As it walks away, it instinctively scratches behind it. Pretending that the crap will be covered up and vanish. And if you complain to the feline for such boorish behavior? It's invariable response is to glare back at you for unfairly criticizing the cat. When you should be blaming the dog! They're gonna need a bigger cement mixer. Fascinating how we're learning how events on the ground can affect the ionosphere. The possibility that earthquake events may produce ionospheric effects has intriguing possibilities for monitoring and maybe even advanced warning. I'm unfamiliar with F1, F2, D and E layers, but I suspect the reason is that they were limited to the historical dataset from 1943-45.